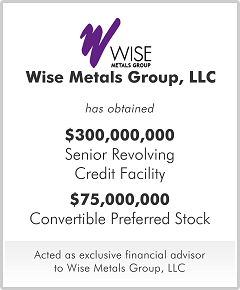 With revenue of over $1 billion, Wise Metals produces approximately 15% of the beverage industry's can sheet for aluminum beverage containers, representing approximately 15 billion cans for such beverages as Coca-Cola, Miller beer and niche brands.Wise required additional liquidity to fund growth initiatives due to increased worldwide demand for can sheet and losses related to metal cap ceilings. M&A Capital identified multiple capital sources that had an interest in providing growth capital to Wise, including: senior lenders, subordinated debt providers and other junior capital sources, and equity partners. After generating proposals from several capital sources, Wise determined that a $75 million convertible preferred security and an increased $300 million senior revolving credit facility provided sufficient flexibility with reasonable dilution. With revenue of over $800 million, Wise Metals produces approximately 15% of the North American beverage industry's can sheet for aluminum beverage containers, representing approximately 15 billion cans for such beverages as Coca-Cola, Miller beer and niche brands. M&A Capital assisted Wise to achieve its objectives with this financing, including: increasing availability under its revolver, reducing financial covenants, lengthening the term, and reducing financing costs. The Senior Public Notes provided Wise sufficient proceeds to repay its outstanding obligations under its existing $160 million revolving credit facility and $35 million of senior subordinated with only a minimal draw under its revolver. Wise retired higher coupon subordinated debt and repurchased the subordinated debt holders warrants at the closing of the transaction. The incremental liquidity under the revolver was available to fund operating requirements, including the pursuit of certain growth initiatives. With revenue of over $600 million, Wise Metals produces approximately 15% of the beverage industry’s can sheet for aluminum beverage containers, representing approximately 15 billion cans for such beverages as Coca-Cola, Miller beer and niche brands. Wise required additional liquidity to fund: (i) growth initiatives, (ii) a refinance of seller notes and (iii) refinance its foreign bank group that was no longer actively participating in the United States market. M&A Capital identified multiple capital sources that may have had an interest in providing capital to Wise, including: senior lenders, B-Loan underwriters, high-yield underwriters, subordinated debt providers and other junior capital sources. After generating proposals from several capital sources, M&A Capital determined the viable alternatives from which Wise's management selected the most accretive solution. M&A Capital worked with the selected sources to close the most viable solution available to Wise.